School boards across New Jersey are grappling with the maintenance challenges of aging facilities. Fortunately, there are state programs available that offer alternative financing, as well as financial incentives for maintaining facilities while lowering energy costs. Newark Public Schools is among districts in the forefront of using available state programs to upgrade their facilities with high-efficiency equipment. As the largest and one of the oldest school districts in the state, annual energy costs have reached $13 million in recent years. Each year the district uses 60 GWh of electricity, 5 million therms of natural gas, and more than 200,000 gallons of fuel oil. To address these growing energy costs, Newark officials are maximizing opportunities offered by New Jersey’s Board of Public Utilities (BPU) through the New Jersey Clean Energy Program (NJCEP) and the Energy Savings Investment Program (ESIP). In 2013 the district chose to undertake an energy assessment of all its facilities using the free energy benchmarking services available through NJCEP. The energy use for each school and facility was measured, providing school administrators with tools to compare the district’s buildings against the performance of similar schools across the state. The benchmarking assessment revealed dramatic differences between facilities. One high school’s electric and fuel bill reached $462,310 per year, more than double the annual cost of comparable schools. 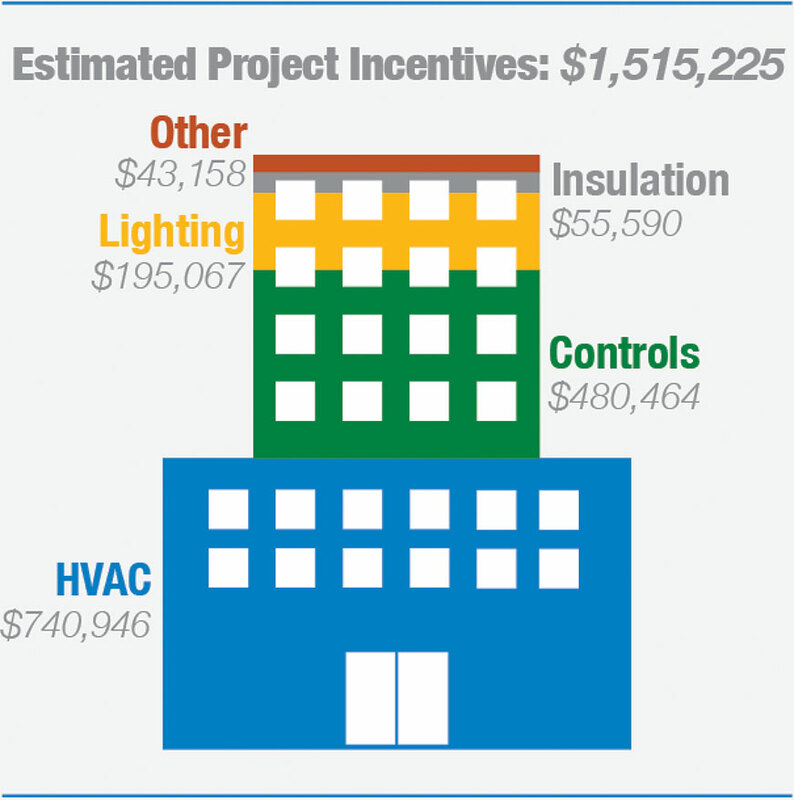 Nearly $1 million in Energy Savings The assessment also identified several opportunities to reduce energy costs, as well as guidance on how NJCEP incentives could help the district invest in advanced energy-saving solutions. Recommended improvements included installation of new lighting, heating, ventilation and air conditioning (HVAC), and control systems. School officials projected these measures would save $166,000 in annual maintenance and $990,000 in annual energy costs. To help cover the costs of these measures, the district was eligible to receive $1.52 million in incentives through the NJCEP Pay for Performance program. Incentives were directly linked to reducing energy use by at least 15 percent of the building’s existing energy consumption with incentives of up to $2 million. For the remaining project costs, Newark Public Schools turned to the state’s Energy Savings Improvement Program (ESIP), which provides schools with the ability to pay for energy-related improvements with cost savings that result from the project. The ESIP financing structure, combined with Pay for Performance incentives, allowed Newark to implement significant energy-efficiency improvements without the upfront expense that administrators typically associate with large-scale maintenance upgrades. All energy-related improvements are paid for using the reduction in energy costs, which is required under the ESIP statute. “Our number one goal is to deliver clean and safe schools every day that support 21st century learning. The ESIP program will catapult Newark Public Schools toward the realization of this goal,” said Keith S. Barton, executive managing director of operations at Newark Public Schools. Lighting upgrades, premium efficiency motors, and condensing boilers are being installed at each facility. Weequahic High is also preparing to install a new, efficient steam boiler. The installation of the new equipment is expected to cost $19 million and generate dozens of local jobs. Newark Public Schools will pay for the new equipment through the 3.94 GWh of electricity savings and 351,000 therms of natural gas savings that are projected by consultants hired by the district. More energy saving improvements are expected in the years ahead. The improvements are also expected to benefit students’ education. New classroom air ventilators and LEDs will allow for greater indoor air and lighting quality, combining to improve the productivity of both teachers and students alike. To help cover the costs of these measures, the district was eligible to receive $1.52 million in incentives through the NJCEP Pay for Performance program. For more information on NJCEP’s Benchmarking program and financial incentives for energy-efficiency projects, contact New Jersey’s Clean Energy Program at 866-NJSMART. Learn more about the Energy Savings Improvement Program and how it can help fund energy-related improvements in your school. This article was contributed by the New Jersey Board of Public Utilities.